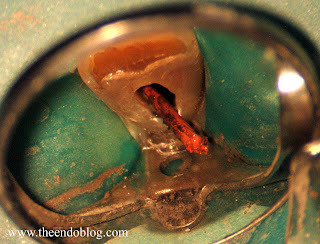 This root canal was originally done in 1965. 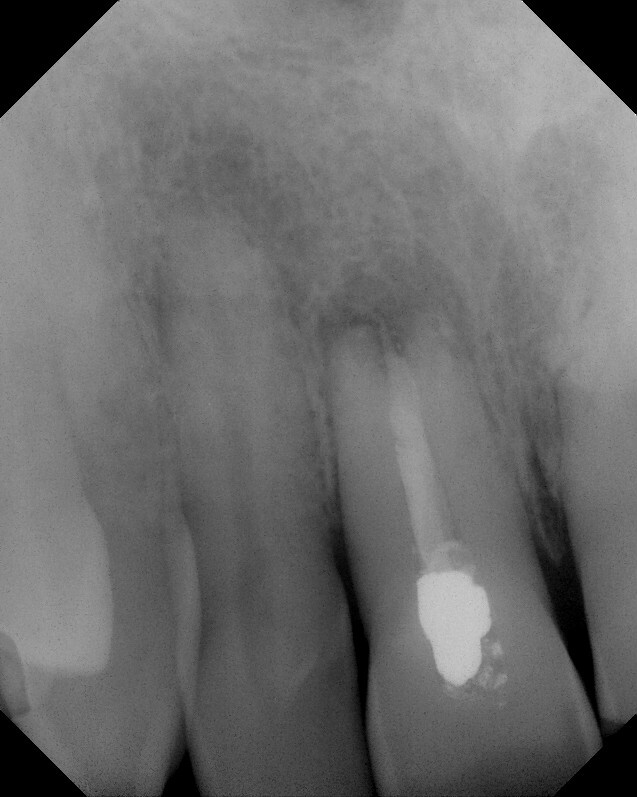 A periapical lesion has developed. While the root canal filling is weak and the apical seal obviously an issue, the tooth is and has been fully functional. Removal of previous gutta percha show obvious corrosion and leakage. It is likely that the tooth had an apicoectomy, due to the short length of the root and open apex. 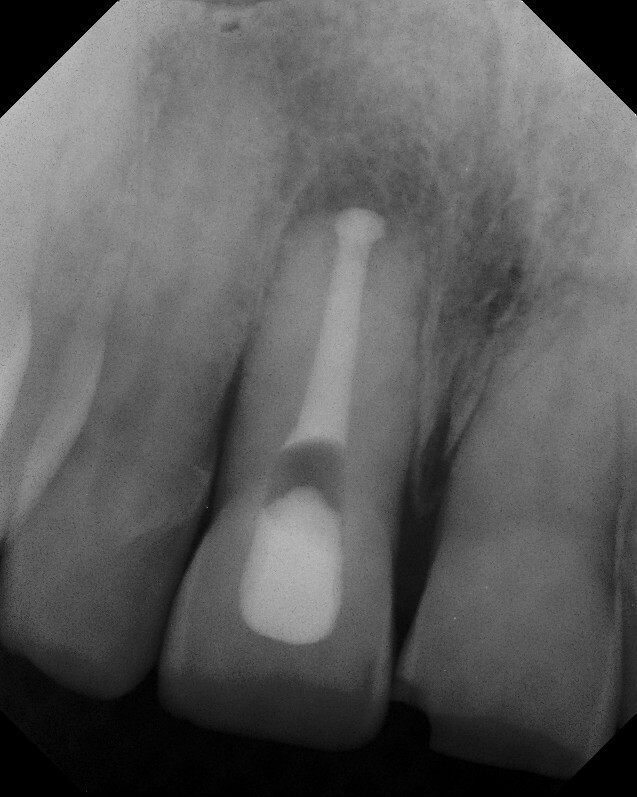 The open apex is debrided and a new apical stop is created. The canal is then obturated with MTA. MTA is chosen as the obturation material due to the open apex and the ease of future apical surgery if needed. I call this a "root canal upgrade". Preserving this tooth preserves the periapical tissues and helps to maintain the bone around the tooth. While there are lots of good replacements for missing teeth, nothing preserve the periapical architecture as well as a healthy tooth & periodontal ligament. Just found out your blog today by accident and read every single post since 2007! What a good job you have done here! Well, I was trained in Brazil and currently practising dentistry in Australia. 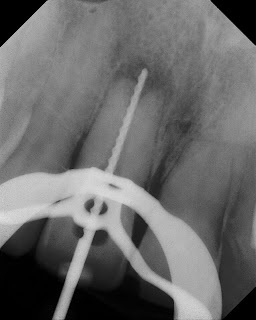 I am not an endodontist, but have focused much of my time on the subject. I have some interesting x-rays to share, if you are interested, and a couple of questions to ask if you can help. Do you have any e-mail address to which I could send this? Again, congrats on the beautiful work you are showing here. This is an interesting case...thanks for sharing. Your blog as a whole is very informative and engaging...keep up the good work. Looking forward to your future posts. Many of your cases and articles would be very great. We were wondering if we could interest you in contributing articles to our site ? gr8t blog and good job with these photos. Great work and skill you have.